I’ve never met Jeffry Mitchell, but having seen his art, I’d imagine him to be a chunky fellow. Not fat, just well built. I’d also imagine him to be extravagantly hairy. Google reveals my hunches to be correct in the first instance, wrong in the second. Is this even relevant? I’d say that in the case of Mitchell’s gorgeously sensual and emotionally tender earthenware sculptures, it is. These objects seem so obviously indebted to the physicality of their maker that body and mind, heart and soul are practically inseparable. 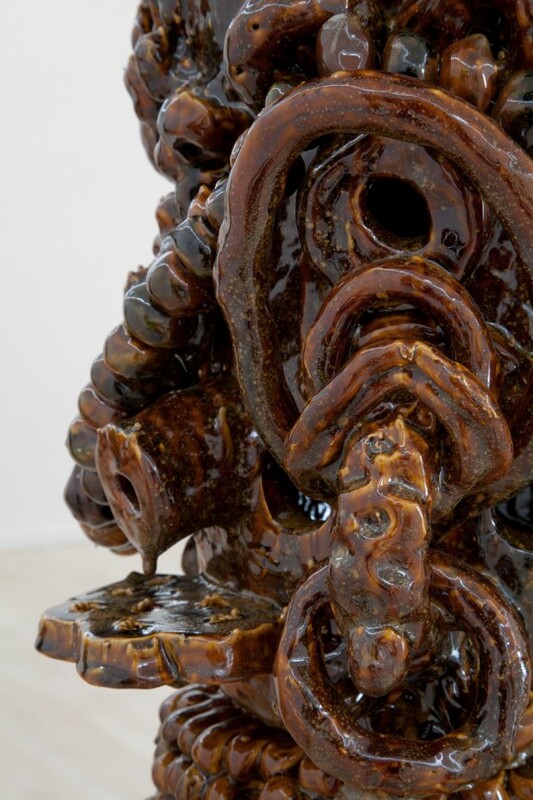 The deftness of the male fingers that pressed soft wet clay into chubby flowers and sturdy chains, the strength of the arms that raised coils into vessels and heaved them onto rough wooden plinths: both are evident in the sculptures and are themselves evidence of the love (both the clean and the dirty kinds), humour and pathos that is poured into them. Mitchell’s work has been well known in his hometown of Seattle for over two decades now, but hasn’t been shown in Los Angeles since 2001. Aside from ceramic works, he also makes ornate drawings, prints and architectural sculptures. This is his first solo exhibition with Ambach & Rice, which relocated to Los Angeles from Seattle last year. 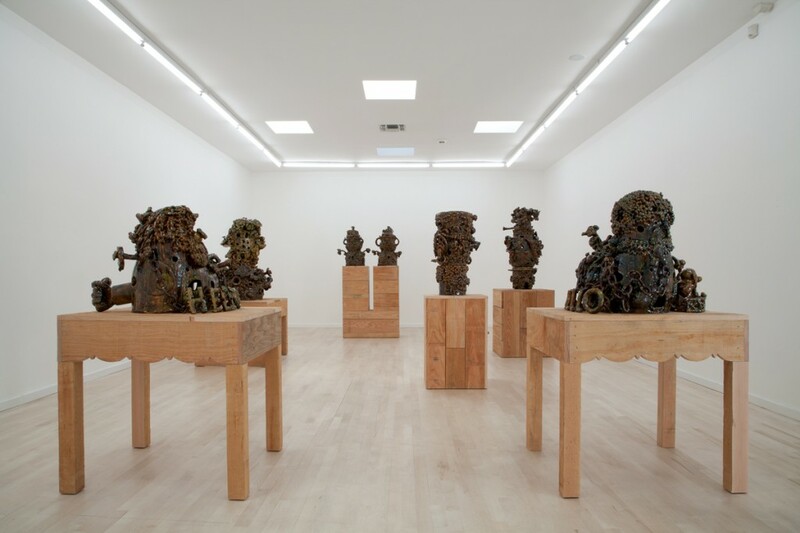 Titled ‘Shamrock Edelweiss Seaweed’, this group of sculptures is bound by a unified palette of brown glazes – which on closer inspection thin into greens, blues and oranges – and rough-hewn wooden plinths cut from packing crates. The objects themselves are so thick with adornment that it is sometimes hard to see what lies beneath. (Jars? Stacks of bowls?) Symbolic motifs (and innuendos) recur throughout: nails, holes, fat-petalled, Disney-esque flowers with lolling stamens, shamrocks, big fingers, flowers whose petals turn out to be fingers. Oversized beads and chains are also strung about them, so that, along with the thick rings that pierce them in places, one is put in mind of beefcake male jewellery. This formal fuzz accounts for my misapprehension about Mitchell’s hairiness. In fact two sculptures, Hello Hello and Pad Pad (all works 2012), actually are hairy, one bearded and tonsured and one dreadlocked. They evoke those famously gauche Staffordshire dog figurines, but also incorporate drawings of a bunny, a sunrise and an eagle, along with a CND sign and Robert Crumb’s bearded cartoon character Mr Natural. Mitchell is profoundly unjudgmental about the high and low references he piles into his work; a separate shelf of smaller figurines includes biblical scenes such as Jesus Kissing Judas as well as the rather more suggestively titled Animal Lover. It is not clear where the artist stands on any of this, accept to acknowledge that it is all part of him, whether he likes it or not.